Compositions By Dusan Bogdanovic On tonebase | Learn compositions by Dusan Bogdanovic from the world's best guitarists! Browse all lessons on compositions by Dusan Bogdanovic. Use the search bar to filter the lessons by instructor, title, difficulty, etc. A richly gifted composer, improviser and guitarist, Dusan Bogdanovic has explored musical languages that are reflected in his style today- a unique synthesis of classical, jazz and ethnic music. As a soloist and in collaboration with other artists, Bogdanovic has toured extensively throughout Europe, Asia and the United States. Giving his debut in Carnegie Hall, and touring major concert venues of the world. He has over fifty published compositions ranging from guitar and piano solo works to chamber and orchestral ensembles, as well as close to twenty recordings ranging from Bach Trio Sonatas to contemporary works. 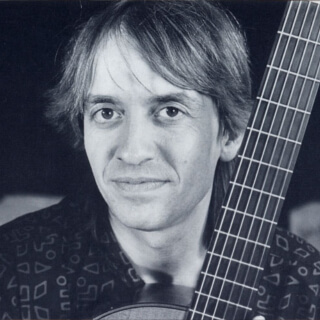 He has works written for pianist Fabio Luz and numerous solo guitar compositions for Alvaro Pierri, David Starobin, William Kanengiser, Scott Tennant, Eduardo Isaac, James Smith and others. After having taught at the Belgrade Academy and San Francisco Conservatory (1990-2007), he is presently engaged by the Geneva Conservatory. He is also an acclaimed author of many theoretical works for the guitar.